Programming for Complex Tools Modern Machine Shop 63 Over time, machine tool motion has become more intricate. In particular, precise control of five- axis machining centers allows for elaborate tool paths. Also over time, CAM software has become more sophisticated, increasing the ease and effec- tiveness with which complex machines can be programmed. But cutting tool forms have remained simple. Standard milling tools come in basic forms that would have been recognizable even well before the age of programmable machining. We take this for granted. However, do cutting tools require simple shapes? As it turns out, they do not. Complex machines can mill complex forms using complex tools—and this last item is the piece that has now arrived and is begin- ning to find its place. Cutting tool maker Emuge offers a line of circle-segment milling tools— so-called "barrel cutters" and others— that offer profiles engineered to effec- tively finish-mill various contoured workpiece surfaces, notably in die/ mold machining. A challenge that makes these tools distinctive is the demand they make of the tool paths. Using these tools effectively requires tool paths that keep the tool's cutting profile engaged with the surface of the part at a precise angle proper for that tool design. To meet this need, Emuge partnered with CAM software providers to develop programming algorithms able to realize the full promise of this tooling. One such partner is CNC Software Inc., developer of Mastercam. Application Engineer Jesse Trinque is one of the company's team members who has been involved in developing Mastercam capabilities tailored to circle-seg- ment tools, and he has worked directly with shops applying this tooling. 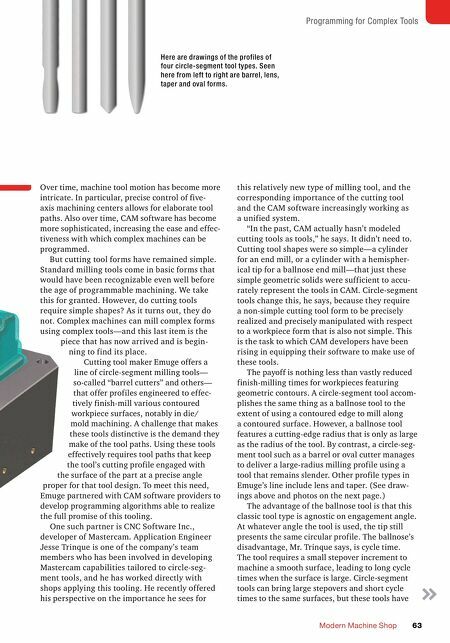 He recently offered his perspective on the importance he sees for this relatively new type of milling tool, and the corresponding importance of the cutting tool and the CAM software increasingly working as a unified system. "In the past, CAM actually hasn't modeled cutting tools as tools," he says. It didn't need to. Cutting tool shapes were so simple—a cylinder for an end mill, or a cylinder with a hemispher- ical tip for a ballnose end mill—that just these simple geometric solids were sufficient to accu- rately represent the tools in CAM. Circle-segment tools change this, he says, because they require a non-simple cutting tool form to be precisely realized and precisely manipulated with respect to a workpiece form that is also not simple. This is the task to which CAM developers have been rising in equipping their software to make use of these tools. The payoff is nothing less than vastly reduced finish-milling times for workpieces featuring geometric contours. A circle-segment tool accom- plishes the same thing as a ballnose tool to the extent of using a contoured edge to mill along a contoured surface. However, a ballnose tool features a cutting-edge radius that is only as large as the radius of the tool. 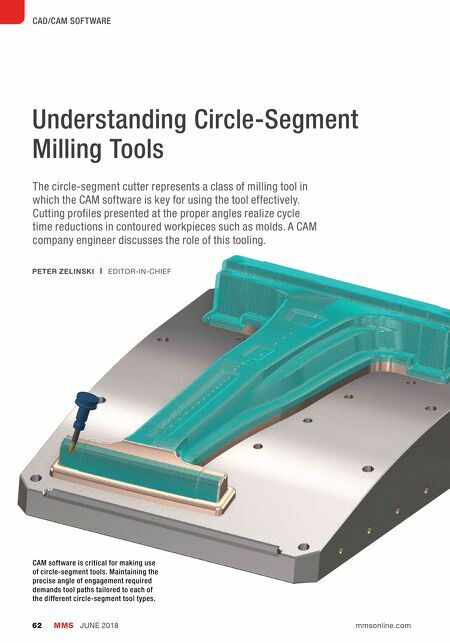 By contrast, a circle-seg- ment tool such as a barrel or oval cutter manages to deliver a large-radius milling profile using a tool that remains slender. Other profile types in Emuge's line include lens and taper. (See draw- ings above and photos on the next page.) The advantage of the ballnose tool is that this classic tool type is agnostic on engagement angle. At whatever angle the tool is used, the tip still presents the same circular profile. The ballnose's disadvantage, Mr. Trinque says, is cycle time. The tool requires a small stepover increment to machine a smooth surface, leading to long cycle times when the surface is large. Circle-segment tools can bring large stepovers and short cycle times to the same surfaces, but these tools have Here are drawings of the profiles of four circle-segment tool types. Seen here from left to right are barrel, lens, taper and oval forms.